The home of beautiful Arabian show and pleasure horses since 1977, Spring Valley Ranch is a showplace in its own right; with a 30 stall barn and indoor arena.. Extra special touches continue to be added to the beautiful arena barn, which includes amenities for both horses and humans, and new clients are being accepted as stalls are available. Owned by Mark Dunlap, D.V.M. and Tania Dunlap, Spring Valley Ranch is a full service, complete, all breed horse facility; offering breeding, boarding, training, conditioning and riding lessons. Also the home of trainers Katherine Fooy and Ricky Johnson, the 44 acre ranch located in the rolling foothills below Paradise (near Butte College) boasts five luxurious barns (containing 65 stalls), mare motel, covered sheds and paddocks, 10 acres of irrigated pasture and four arenas. Attention to detail and professional management is evident in the extra services provided: 24 hour security cameras, individual tack lockers, a scale to weigh horses admitted for boarding or training, and strict health policies regarding vaccination, worming and feed programs. 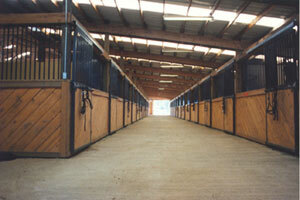 The barns are solid wood construction, finished outside with stucco and they’re built with the needs of horses and horsemen in mind.Horsemen will appreciate the attractive tongue-and-groove wooden stall fronts, while their horses will enjoy the stall sizes: stalls in the breeding barns are 12’ x 16’; and stalls in the training barn and big barn range in size from 12’ x 12’ to 12’ x 14’ so that even larger horses can be accommodated. There are five hot water wash racks, four tack rooms (20 individual tack lockers) and a covered, enclosed overhead hot-walker. All arenas are under lights and sprinklers. The main arenas are watered every day and the footing is renovated weekly. Riding is a pleasure in any weather. A professional staff is available to take care of your horse’s needs, from turning the horse out, providing exercise through lunging or riding, grooming, blanketing, graining and medicating. Spring Valley Ranch with Katherine and Ricky always have a selection of horses available for sale, from babies to finished show horses. For more information about the ranch, call (530)891-8493; email tania@springvalleyranch.com; or send inquiries to Spring Valley Ranch, 3900 Doubletree Road, Butte Valley, California 95965.